It was a risky idea but I think it payed off! Hey, if they can put beans in their brownies – I can put carrots in mine! Line a 9″ x 13″ dish with foil, leaving it overhanging on the shorter sides. In a large mixing bowl, whisk together cocoa and boiling water. Add the chocolate and whisk until it’s melted and smooth. Do not lick the whisk – it’s hot! Add the melted butter and oil and whisk again. Now switch to a spatula or a wooden spoon and stir in the flour, ginger and salt. Pour the brownie batter into the prepared baking dish. Set aside. In a small mixing bowl, mix the cream cheese with an electric mixer until smooth. Add the egg white and sugar and mix for about 2 minutes. Spoon the cream cheese mixture onto your batter and stir it in gently to create the marbling effect. Bake 30 minutes. It will be gooey in the middle, but it will set during cooling. If you are interested in joining the Improv Challenge, contact Kristen of Frugal Antics of a Harried Homemaker. carrot brownies thats a first for me! Carrot brownies? whoa…that's something I must try! They look fabulous. This is genius Anna! Wow. 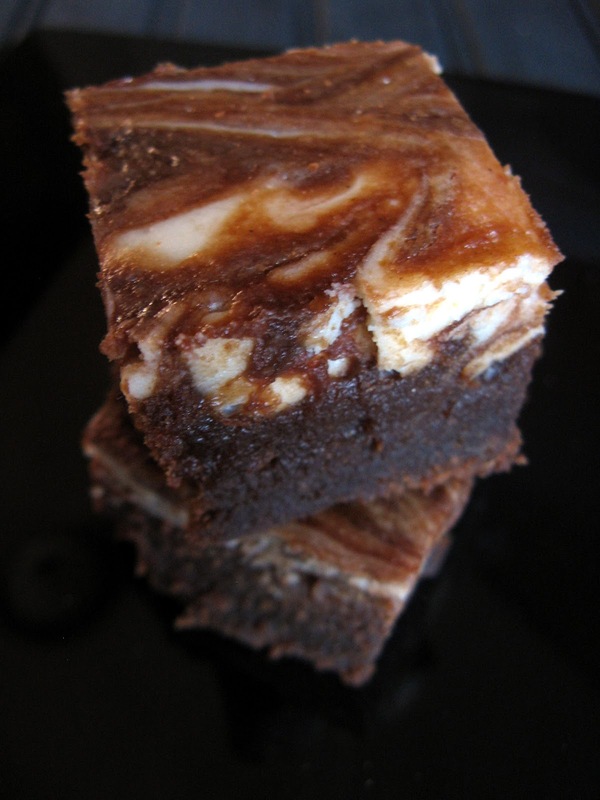 I imagine the carrot puree adds a bit of moisture to these brownies and makes them perfect. And the addition of ginger and cream cheese. WOW. What a unique and beautiful treat! Hope you are having a marvelous start to your week! They look so moist. Yum! This looks so good! Will definitely make these! What an unusual and yummy flavor combo! Gorgeous looking brownies! Such a great idea to make them into a brownie. A healthy brownie at last! lol They look so moist and I know they're delicious. A must try! you really managed to create something special, great combination! I am so glad you went with a chocolate dish….perfect for February and for the challenge. Those brownies sound deeeelicious! These sound wonderful, and they look delicious! Anna, these brownies look amazing! I love the flavors you used. Great blog you have here – I'm glad to have found you! Anna, I just want to reach right through the screen and grab one of these yummy delicious looking brownies. Thank you for stopping by today and for your kind words, you made my day! 🙂 If you can make it, I would love for you to come by and link up with us on Fab Friday. Doesn't sound crazy at all, sound amazing!! Must try these! They look amazing!! These look fantastic! I'm trying to wrap my head around what a ginger-carrot-cream cheese- chocolate brownie (thats a mouthful!) tastes like, I love your unique recipe, I'm going to keep this one marked! They look super moist and fudgy, love this idea!! I think I'd prefer carrots to beans in my brownies 🙂 Lovely swirls! Gorgeous! That swirled top looks amazing! Found you through the Challenge! Love the marbled top! Your brownies are gorgeous and sound like such a great and unique spin on a classic. Love it! Anna…how wonderful! I always love to see what people sneak into brownies. But carrots…which are naturally sweet…is a fabulous idea! They look so fudgy and moist! what a great idea for these two ingredients! glad I came across your blog 🙂 looking fwd to reading more! I love hiding veggies in yummy foods like these! Great recipe :)! Brownies with ginger and carrots, now there's something I would be willing to taste test. I hope you will try them. Thank you so much, Kita! That is really creative! I love that they are brownies! This looks so yummy! I would love for you to come by and link up to my Recipe Party at The Sweet Spot! These are what you call the “bestest” brownies. There really should be such a word. They look good enough to eat, right fromt the computer screen. Amazing blend here with the carrots! 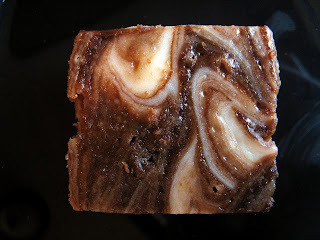 Also I love those nuts and swirl at the top of these brownies. You aced this challenge for sure-yum! That's right – nuts would be fabulous in these! Thank you, Tina! Ginger and carrots are a great pairing, but I'd never have thought to put them into a brownie. Great idea and they look absolutely perfect. Your brownies look wonderful and sound delicious. I was thinking the same, Suchi 🙂 But it's so worth it! Thank you! Oooh I'm drooling! !Gorgeous just gorgeous!! Anna, I found several gingerbread recipes which called for cocoa. I'm a slight purist, desiring my chocolate to be chocolate & my ginger to snap with ginger! But I must say, your brownie recipe looks absolutely delicious — I'm going to have to try it out on my guys! Please do! I have a feeling they will love it 🙂 Thank you, Melody! A pleasure to have found your blog, I too am a mom of 3 (albeit 2 boys and 1 girl)! Thank you so much, Rachel! I am a big fan of yours 🙂 Hugs! I like marbles on the brownies. Even though carrots and ginger calls for curry in my head (I am a bit hungry), this is a great treat too!